When I asked Christine to write this blog piece, I had no idea how timely and needed it would be. Our family is going through a big transition right now-- new jobs, new schedules, new daycare, no binkies, oh and I’m 33 weeks pregnant. Sometimes the stress of all of it leads to ugly crying on the kitchen floor or slamming doors or unintentional yelling, just as a way to release that anxiety. I won’t pretend that my situation is unique and I know I’m not alone, but I also know that I need a healthier outlet for stress. One of my biggest fears about adding another tiny human into our family unit is my personal ability to cope with stress in the moment. If I am perfectly honest, I am much more prone to the outburst than I’d like. I threw a cry for help out on instagram stories the other night for your favorite ways to reduce stress in the moment, and boy did I appreciate hearing everyone’s perspective. Also, super clear that some of you don’t have children and partners who work late (I’m looking at you “pour yourself a glass of wine and take a bath, shutting out the world” or “go on a long run”). 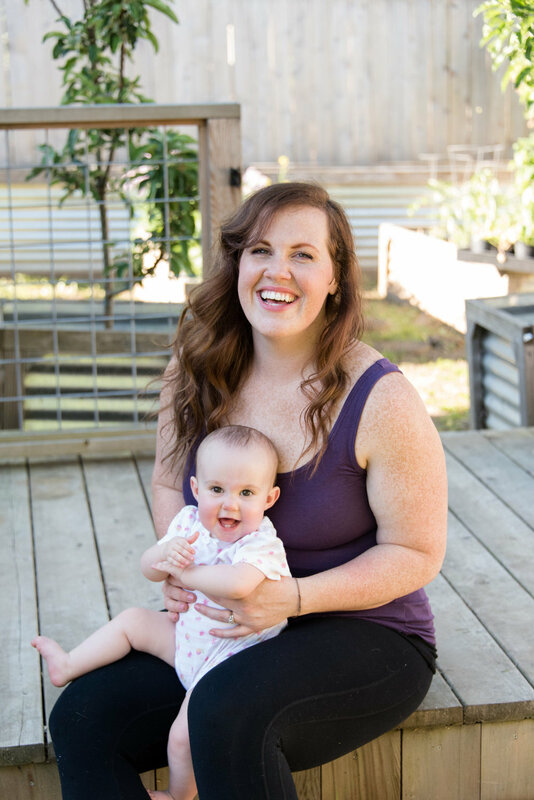 My go-to is the first listed below: a quick burst of exercise, (because again I’m the door slamming type so that type of powerful exertion is cathartic) but I also realize that early postpartum, when stress will be at its height, that may not be an option. So what other ways can we quickly reduce stress, disconnect and create space between the stressors and our reaction without having to find a sitter or dedicating a large amount of time? How can we turn it around in the moment? Exercise produces endorphins, which are “feel-good” neurotransmitters that improve mood. (1) Think of exercise as a moving meditation. Focus on the movement itself while connecting with your breath. Whether it be a simple walk or a heavy lifting session, continually connect your breath with movement. Next time you’re feeling stressed, overwhelmed, or anxious, try a quick workout. Tabatas (a type of interval training with 8 Rounds :20 work/ :10 rest) are a great way to get the heart rate up quickly and clear your head. Release pent up energy by alternating squats and medball slams. If you need to move through slower, more intentional movement and breath work, flow through the BIRTHFIT Functional Progressions or try some sun salutations. Speaking of connecting to your breath, when was the last time you took an intentional breath? Next time you feel that stress building, pause and take 10 of the deepest, full body breaths you can muster. This can help activate the parasympathetic nervous system; our rest and digest mode, rather than our fight or flight instincts. The best thing about deep intentional breaths? Literally everyone can do this in the moment to create space between the stress stimulus and your response. Take a moment, close your eyes and breathe deep! Journaling doesn’t need to be the “dear diary…” entry you may have done as a child, but rather it can be a great tool to organize your thoughts from the day, work through complex emotions, or uncover what is triggering your stress and anxiety. Try prompts like: The things that can help me most in this moment are… or Right now I am ______ and I want to be ______. Put the pen to paper, set a timer for 5 minutes and just write whatever comes to your mind (don’t stop until the time ends). Using essential oils for quick aromatherapy is an easy way to calm nerves and soothe stress and anxiety. (3) Scents like lavender, peppermint and eucalyptus help reduce stress. (3) Essential oils can be used in a few different ways. Add essential oils to a humidifier or diffuser to spread scent throughout your home. Some of the best oils for stress reduction are lavender, chamomile and frankincense while other oils like spearmint, thyme or clove may be too harsh to use directly on the skin. Experiment with different essential oils or oil blends to find what works best for you in times of serious stress! Hugs stimulate oxytocin, a soothing hormone that can help to decrease feelings of stress and anxiety. Hugs and physical touch make us feel supported and improve overall happiness. Family therapists recommend 4 hugs per day for survival, 8 hugs for maintenance, and 12 hugs for growth! (5) These benefits apply to any type of soothing touch like holding hands, cuddling or even a therapeutic massage. (4) Grab your kiddo, partner or pup and bring them in for a big stress-relieving hug! Playing your favorite music is a no brainer when it comes to in the moment stress reduction. (6) Put together a playlist of go-to songs that will calm you (or your little one). If you aren’t in the mood for music, listening to a podcast can help refocus your attention away from whatever is stressing you out in the moment. The wonderful thing about podcasts is that there are SO many to choose from on any topic you can think of! Don’t discount these simple tools that allow us to tune in to tune out. What are your favorite ways to reduce stress in the moment? Have you tried anything on this list? Exercise and stress: get moving to manage stress. www.mayoclinic.org. https://www.mayoclinic.org/healthy-lifestyle/stress-management/in-depth/exercise-and-stress/art-20044469. Reviewed March 8, 2018. Accessed September 13, 2018. Writing about emotions may ease stress and trauma. www.harvardhealth.com. https://www.health.harvard.edu/healthbeat/writing-about-emotions-may-ease-stress-and-trauma. Accessed September 13, 2018. Lee, YL, BSc, et. al. A systematic review on the anxiolytic effects of aromatherapy in people with anxiety symptoms. J Altern Complement Med. 2011;17(2),101-108. What are the benefits of hugging? www.healthline.com. https://www.healthline.com/health/hugging-benefits#5. Reviewed April 10, 2018. Accessed September 13, 2018. Magic touch: six things you can do to connect in a disconnected world. www.forbes.com. https://www.forbes.com/sites/carolynrosenblatt/2011/01/18/magic-touch-six-things-you-can-do-to-connect-in-a-disconnected-world/#3f78ee9651af. Published January 8, 2011. Accessed September 13, 2018. The power of music to reduce stress. www.psychcentral.com. https://psychcentral.com/lib/the-power-of-music-to-reduce-stress/. Updated March 22, 2018. Accessed September 13, 2018.